Xena Exchange was founded in 2017 by former employees of investment banks and technology companies such as J.P. Morgan, Deutsche Bank, UBS or Kaspersky Labs. The company offers easy access to trade Bitcoin, Ethereum and Litecoin among other cryptocurrencies. 0.03% (takers) / -0.03% (makers receive rebates). Founded in 2017 by Anton Kravchenko, Xena Exchange is a UK-based cryptocurrency exchange that allows individuals and companies to trade cryptocurrencies such as Bitcoin, Ethereum and Litecoin. Currently it’s possible to trade Crypto/Crypto and Crypto/USDT pairs, although additional cryptocurrencies and tokens are expected to be added soon. The main focus of the company is offer a high quality, efficient and transparent exchange to serve the needs of three major groups of professional crypto-market players: active traders, portfolio managers and HFT and algorithmic traders. But, as we will see later, novice traders and investors are also welcome to Xena. The process of opening an account at Xena Exchange is quite easy: just enter your email address, verify it and provide some basic information. Although it’s not mandatory, once you have completed the registration process it’s advisable to verify the account in order to increase withdrawal limits and obtain more security features. There are three different ways to execute trades on these cryptocurrency pairs: a simple interface called Portfolio, an advanced web-based Trading Terminal, and the Xena API. 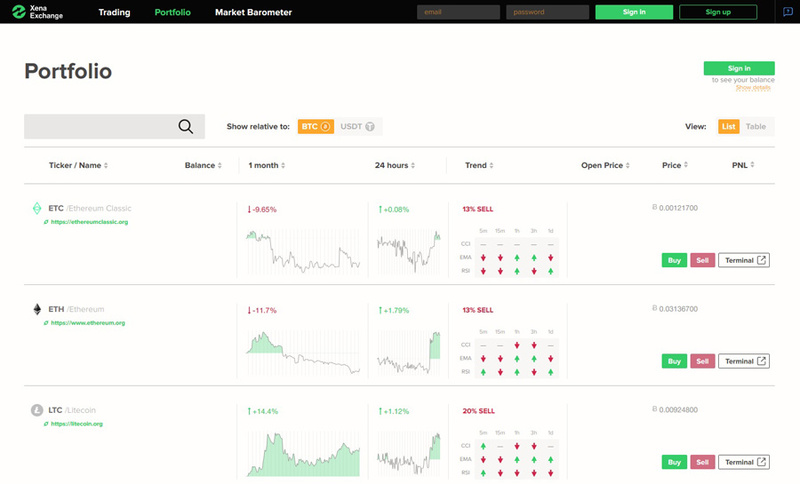 The Portfolio page is catered to crypto investors and novice traders looking for a clean, easy-to-use interface where you can see at a glance all the information about your portfolio and quickly buy and sell cryptocurrencies. Some useful technical information is also available for different timeframes. But what it has made me fall in love with Xena Exchange is its Trading Terminal! At first glance, the look and feel reminds me a lot of Binance trading interface (in fact the platform has the same advanced order types), but if you look carefully there’s more to it than meets the eye. 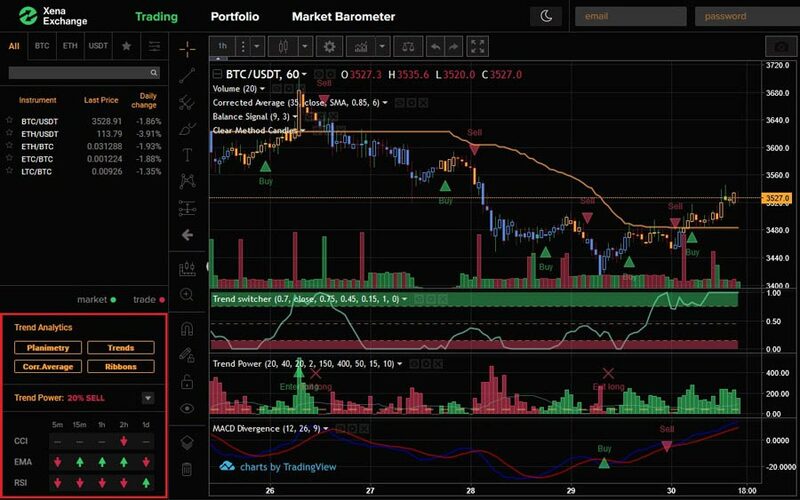 In that panel you can find the Trend Power, a proprietary tool that generates signals from common technical indicators (CCI, EMA, RSI) on different time-frames. Additionally, there are four predefined templates (Planimetry, Trends, Corrected Average and Ribbons), which are applied to the current chart with just one click. And this is just for starters: if we examine the company’s roadmap, there will be more studies and signals soon; also multi-leg trades, fast orders directly from the Market Depth widget and the possibility to create arbitration strategies are on the way. Last but not least, Xena Exchange provides three different API endpoints (Web-Socket Market Data, Web-Socket Trading and REST Transfers) for algorithmic traders. In the next months, the company will offer new features such as connection via FIX protocol and the possibility to create advanced trading strategies using neural networks. Another strong point of Xena Exchange are its extremely competitive trading fees. Takers (traders executing market, stop and market-if-touched orders) are charged 0.03%, well below the average fee charged on other exchanges while makers (traders providing liquidity using limit orders) receive a rebate of -0.03%, something quite unusual on other exchanges which just waive fees to makers. At this moment, Xena Exchange only accepts deposits and withdrawals in cryptocurrencies. In particular, the following cryptocurrencies are accepted: Bitcoin (BTC), Ethereum (ETH), Ethereum Classic (ETC), Litecoin (LTC) and Tether USD (USDT). Security is a top priority at Xena Exchange. Users funds are stored in cold wallets, with keys geographically distributed in secured locations with no exposure to the web. In case of using hot wallets, they always carry the minimal possible amount of funds and their keys are spread among containers in the Google Cloud, detached from a certain server or physical location. The company also performs cryptographical multi-factor verification of deposits and withdrawals and regularly tests security for each software release in order to ensure there are no vulnerabilities in the software. Finally, trading operations are analysed to detect and prevent market manipulation (i.e. wash trading) as well as any other toxic activity. Xena Exchange is a relatively new crypto-exchange but the first impression has been quite positive. 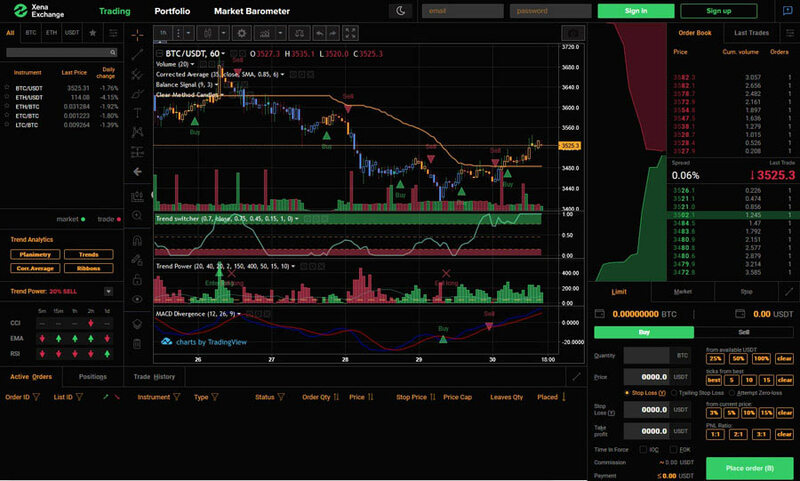 In particular, the advanced Trading Terminal has surprised us very pleasantly, as the proprietary technical tools and the TradingView charts add great value to a very complete web-based trading platform. Also the maker rebates are good news for algo traders, which will feel at home, as Xena Exchange provides services such as colocation and fast execution of orders in milliseconds, and will offer FIX connection soon. But Xena Exchange is not only for the advanced, sophisticated algo traders: novice traders and crypto-investors can also benefit from the simple but effective Portfolio interface. If I had to be critical, we’re missing here more cryptocurrency pairs to trade (probably they will added in the next months), the possibility to deposit fiat money and mobile apps for iOS and Android (they will be launched soon). But if we take a look to the roadmap of this exchange, you will understand why Xena Exchange is a promising choice: margin trading and funding as well as crypto-derivatives, the possibility to manage funds using PAMM and MAM accounts or the ability to write trading strategies using a machine learning framework are just some of the exciting features that the company is preparing to release in the next months. An innovative cryptocurrency exchange built by investment banking professionals aimed to grasp financial institution flows. We provide higher returns environment for traders, segregation and liquidity pooling along with digital assets derivatives products.